The mid length hair style offers many options for styling that include totally different looks. Adding all over curls, or flat ironing the hair super straight can completely change the look of the same exact hair style. Consider the following styles, partial up do, ponytail up do,all over wavy and all over straight hair styles as options for your next look. Partial Up Do - This style features a portion of the hair in the crown area pulled back into a ponytail. Height can be added to hair in the crown area by gently back-combing small sections of hair before smoothing over the top with your fingers. A higher crown area creates a more formal look for the style. Add decorative hair pins to hair on the sides to keep hair in place and also add some color to your look. For a variation of the partial up do, leave out some wispy long strands of hair around the face and pin curl them. The waves and looseness of the style will create a more romantic, formal look suitable for occasions such as weddings, proms or graduation ceremonies. Ponytail Up Do- This up do features all of the hair pulled back into a ponytail for a formal look. It used to be that ponytails were only meant for the gym and lazy weekends. Now women are wearing these super-easy styles to red carpet events. To create an extra straight and smooth up do, flat iron the hair from roots to the ends before pulling it back into a ponytail. Spray on some shine serum after styling to create a super shiny finish. The ponytail can be worn anywhere- formal or informal occasions-and it is a style that you can easily learn to create on your own. All Over Waves- The mid length hair style can look super cute styled all over wavy. A haircut with lots of long layers is very suited for the wavy look. Apply a curl-enhancing cream or gel to damp hair and blow dry using a diffuser attachment. Add soft waves throughout with a medium barrel curling iron. All Over Straight- A popular style for any length of hair, the all over straight look is very eye-catching for mid-length hair as it really pulls out any highlights mixed in throughout the hair. Highlights added around the face help to brighten your look. Add soft sideswept bangs for an even more alluring look. 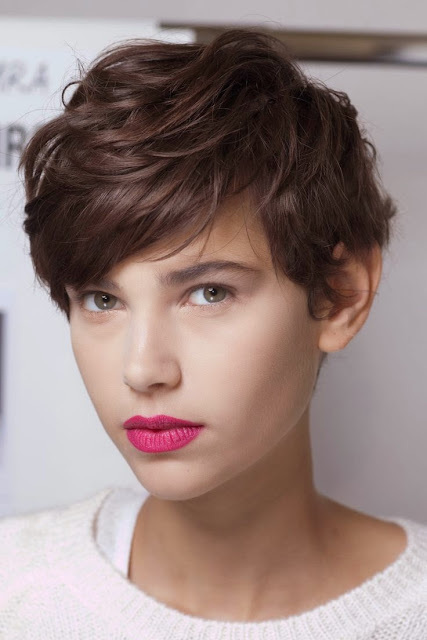 Long sideswept bangs cut around the face help to soften a hairstyle and add a certain dimension to the overall look. In short, these 4 different types of styles for the mid length hair style are great options for 2011 and beyond hairstyles. The mid length cut will allow for more style options than shorter versions and also the mid length haircut will be much easier to take care of and style than longer hair. See more hair styles for mid length hair and get ideas for your next look.